Bernie Sanders endorses Hillary Clinton. Bernie’s Hillary Endorsement Wasn’t Joyful. But It Was Just What She Needed. Bernie Sanders introduces Hillary Clinton at Portsmouth High School on Tuesday in Portsmouth, New Hampshire. 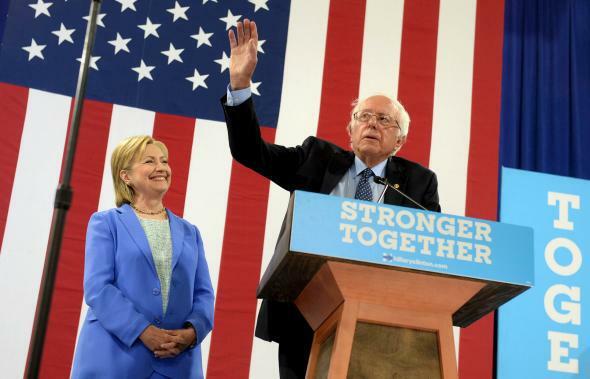 Bernie Sanders—at long last—endorsed Hillary Clinton for president on Tuesday in a speech that was by turns perfunctory and enthusiastic, but always on party-unifying message. “I intend to do everything I can to make certain she will be the next president of the United States,” Sanders declared shortly after stepping on stage with his former primary rival at a rally in Portsmouth, New Hampshire. For months now—dating back to even before Clinton became the Democratic nominee in all but name in early June—Sanders has promised that he would do whatever he could to keep Donald Trump out of the White House, which made Tuesday’s official announcement largely a matter of when, not if. Still, Bernie’s endorsement did not have to be surprising for it to be important. The possibility—as small as it was—that Sanders would stay on the sidelines was one of the few known wild cards that posed a fundamental risk to Clinton’s chances in the general election. That wild card has now been removed from the deck. Perhaps as important as anything else, Sanders made sure to acknowledge the legitimacy of Clinton’s primary victory, something some of his most die-hard supporters still refuse to accept. “When the roll call at the Democratic National Convention is announced, it will show that we won almost 1,900 delegates, far more than almost anyone thought we could win,” he said. “But it is not enough to win the nomination. Secretary Clinton goes into the convention with 389 more pledged delegates than we have and a lot more superdelegates.” Hillary and her friends at the DNC could have lived without the superdelegate mention, I bet, but they can console themselves knowing that it will likely be the last one they hear from Sanders this year. Clinton is hardly the most beloved figure on the left and there will always be a few holdouts that remain in the Bernie-or-bust camp. But at this point, if President Obama, Joe Biden, Warren, and now Sanders aren’t enough to bring them around, it stands to reason that Clinton never had a chance to win them over in the first place. Instead, she can now focus on cementing support from the majority of his fans that has already shown they are willing to rally around her. A new Pew poll released last week found that 85 percent of Sanders supporters say they will support Clinton in the general election, with just 9 percent saying they plan to vote for Trump. A Washington Post poll from late last month told a similar story, with only 8 percent of Bernie backers saying they were on Team Trump—down from 20 percent in the same poll the previous month. Eight years ago, following a bruising primary fight between Clinton and then-Sen. Barack Obama, Hillary’s fans were significantly slower to shift their support to their party’s presumptive nominee. By November, though, they helped put Obama in the White House. The never-Hillary attacks from some corners of the left won’t end with Sanders’ endorsement. Her critics will continue to complain—and not without merit—that she and her husband are too close to Wall Street, and too willing to skirt the law for their own political and personal advantage. But those taking those shots at Clinton will now be taking them in their own name, not in Sanders’.